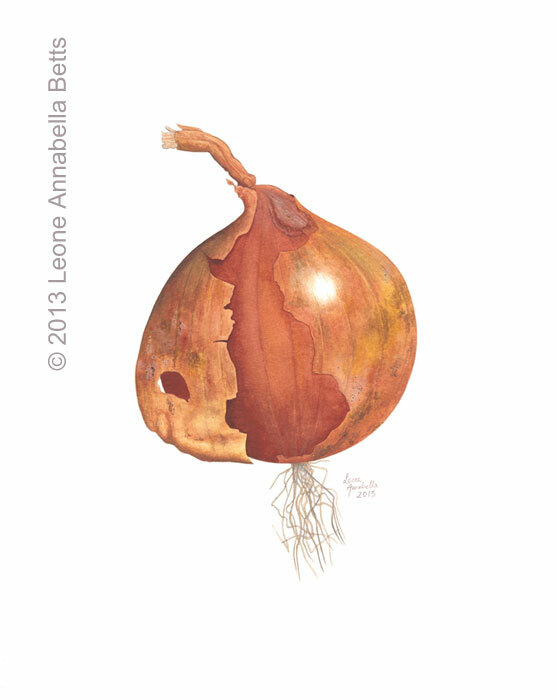 I started painting onions in the middle of winter because I wanted to have a go at something botanical and there were no flowers in bloom. I was also living in a town at the time, without a garden or easy access to the countryside. So I searched the kitchen cupboards and that’s how it began. 1 They’re beautiful. And it’s nice to really look. Personally, I’d been chopping them up and chucking them into pans and dishes all my life without ever taking the time. 2 They’re great for variety of texture and colour, especially if you buy one with roots, wait until an outer layer or two comes loose and let it sprout a little at the top. I love that old vs new feeling you get when the elderly, brittle, brown skin is juxtaposed with the new, supple, green shoots. 3 They last a LONG time. Which, if you’re already into painting botanics, you’ll know is a bit of a relief. After all, how often have you turned your back on some lovely flower for a cup of tea only to find it has moved? 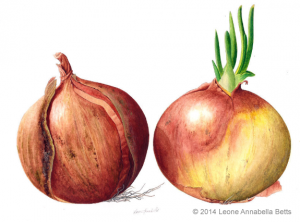 Buds open, petals droop, leaves drop, and the whole plant tilts towards the changing light, but onions stay the same. Well, almost. 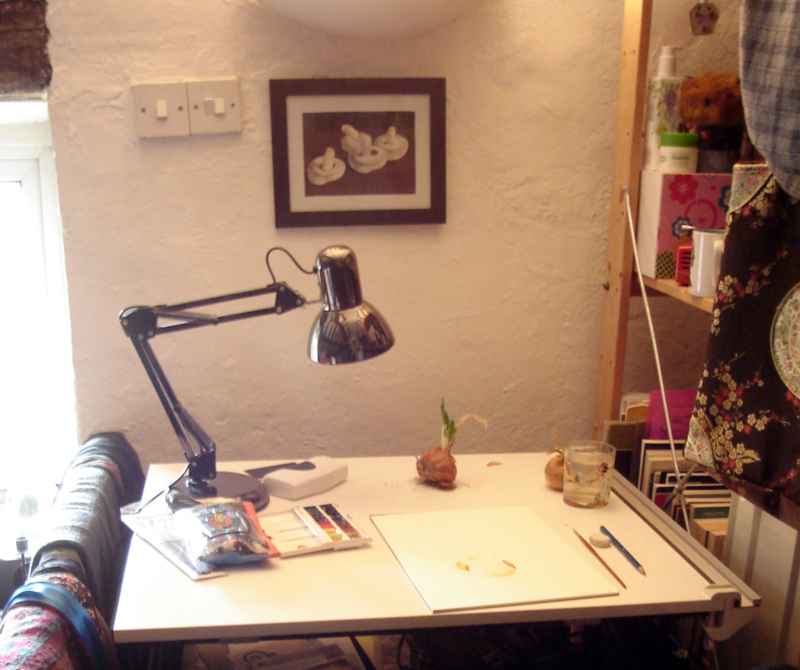 There are little shifts if you sit there long enough but I have had an onion remain unchanged for three weeks before now, and that’s a special kind of joy. 4 They’re easy to get hold of. As I mentioned at the beginning of this post, you might even have one in the kitchen. If not, they’re cheap to buy and let’s face it, as artists we all go through times when that matters, especially when you’re starting out. 5 People like pictures them. Yes, I was surprised too. But they do. If you’re painting a present for someone, they’re also a more unisex choice than flowers, which are often associated with women. Plus they’re a great gift for any keen gardener or chef. 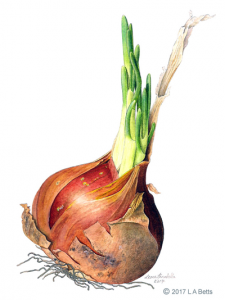 4 Crisp up the edges when you’re done by darkening them ever so slightly with a very fine brush, or by outlining the finished onion in pencil. It’s best to do this last and only where needed. If using pencil, it’s important to use a light-coloured (i.e. hard) pencil with a sharp tip. Soft pencils are too dark and make it harder to be accurate. At no point should the pencil line be more obvious than the paint. 5 Invest in quality materials. I know it’s expensive but it’s worth it. Decent paper, brushes and paint make a difference to your work. I tend to buy things bit by bit, rather than in one splurge. Incidentally, I have recently gone cruelty-free, and no longer buy sable brushes, paints made of burnt bones and so on. Of course, what you use is completely up to you, but in case you’re interested, I now go for the following watercolour painting materials: Gansai Tambi Japanese Watercolours, Bockingford Watercolour Paper (I use Hot Pressed), Da Vinci Casaneo Watercolour Brushes or brushes in the Jackson’s Raven range. However, it has to be said that the Gansai Tambi watercolours do have slightly shiny finish when dry, which I rather like but isn’t to every painter’s taste.